To date, the majority of articles about the upcoming L-train repairs have focused on the transportation alternatives while the MTA upgrades the Sandy-damaged Canarsie Tunnel. The 15-month L-train shutdown between Bedford Avenue and Eighth Avenue begins in April 2019. Demolition and reconstruction of approximately 60,000 linear feet of duct banks, 14,400 linear feet of track and track bed, 270,000 linear feet of cable ducts and associated cables, repair of 7,000 linear feet of concrete lining, and the installation of tunnel lighting and fire systems. The tunnel will be also be protected from future storms with resiliency measures including construction of resilient cables and ducts and the installation of a new discharge line. Prior to the tunnel closure, extensive station work will be performed that will increase operational efficiency and improve accessibility and circulation. 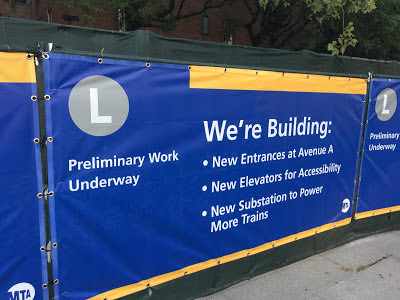 Station improvements at the 1 Av and Bedford Av L Subway stations will include new stairways, and four accessibility-compliant elevators and other work to improve customer flow. Preliminary work started in the summer of 2017 on building new entrances at Avenue A and a new power station at Avenue B. 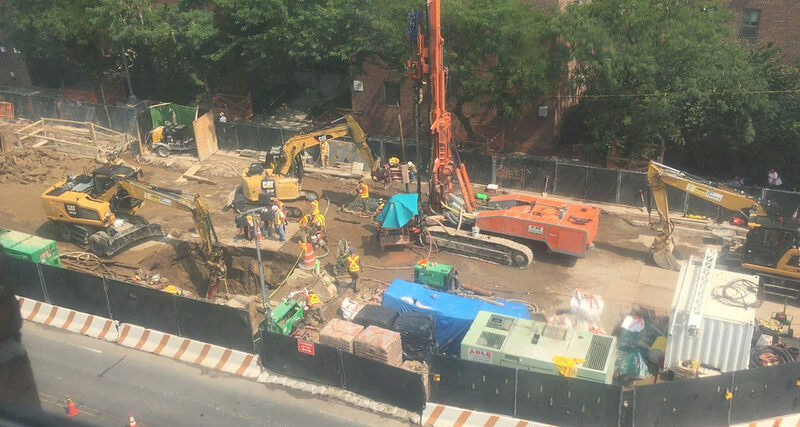 Since then, 14th Street between First Avenue east to Avenue B has been an active construction zone with a variety of trucks, drill rigs, pile drivers, compressors and generators. Meanwhile, 14th Street between Avenue A and First Avenue is down to one lane of traffic in each direction. This is a large — and noisy — project that has already taken its toll on nearby residents and businesses. 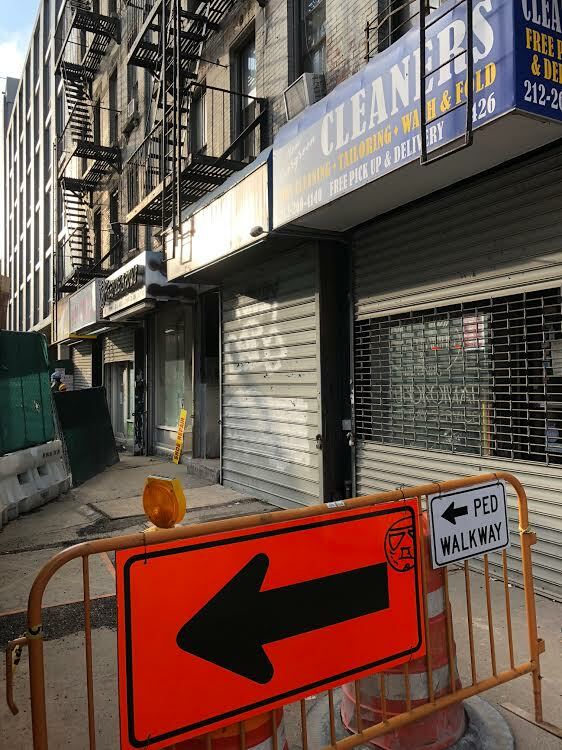 However, as some 14th Street residents recently discovered, as bad as it has been the past year, the construction is going to get a whole lot worse. 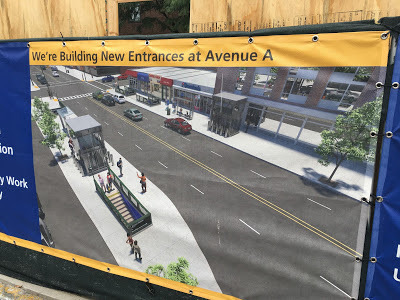 A group of residents living at 542 E. 14th St. at Avenue B said that 14th Street and Avenue A will be the main access point for the 24/7 delivery of new Canarsie Tunnel infrastructure as well as the portal for removing debris from the tube. Describe what you have been through with the L-train work to date. 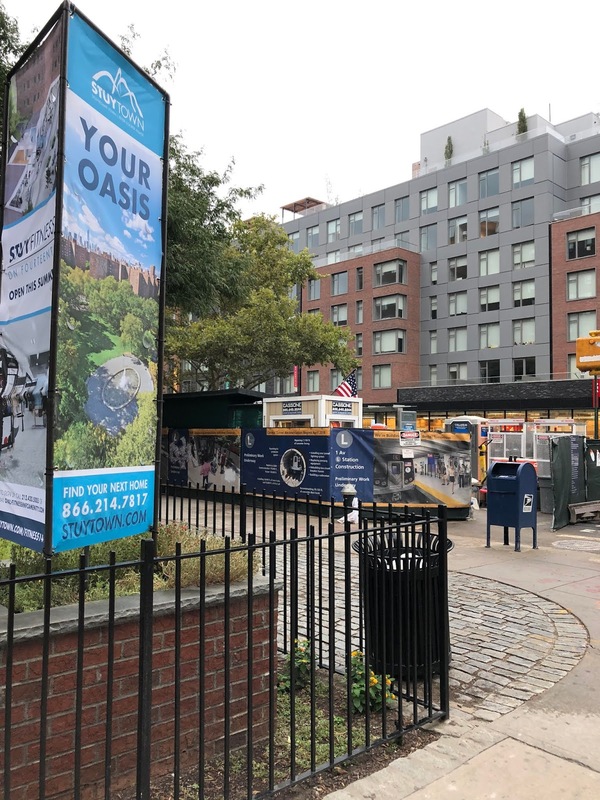 Our first inkling that something was up was on Aug. 5, 2017 (a Saturday), when workers showed up and quietly dismantled the bus stop at the corner of 14th Street and Avenue B. There was no community announcement about a construction job about to begin at that location, no posted announcement about the bus stop removal. Soon after, workers arrived and began chain-sawing down the 70-year-old trees across from our building. 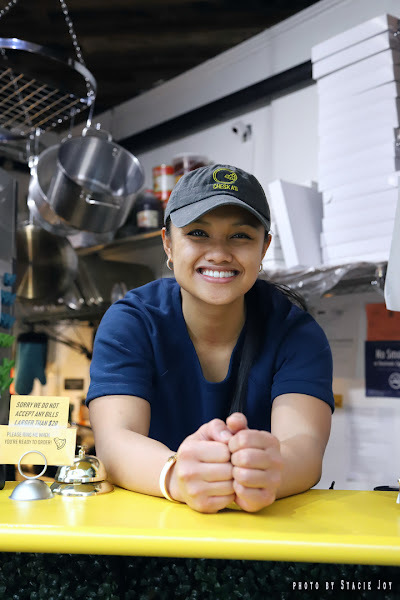 Since that time, the project and site have been growing and growing — from Avenue B to First Avenue, on both the north and south sides of the street. The noise and pollution have made our building untenable. For almost a year, we've had on our block (14th between A and B) over 30 diesel machines (generators, four-story drills, compressors, bulldozers, backhoes, etc.) running six days a week, from 7 a.m. to 11 p.m. The noise has been astounding. We've regularly made recordings of decibel readings in the high 90s to 120 on many of the machines — way above DEP allowable levels. We've also reported diesel run off into the streets and gutters. For as horrific as the scope of the project has been, it has continued to get worse in every respect. 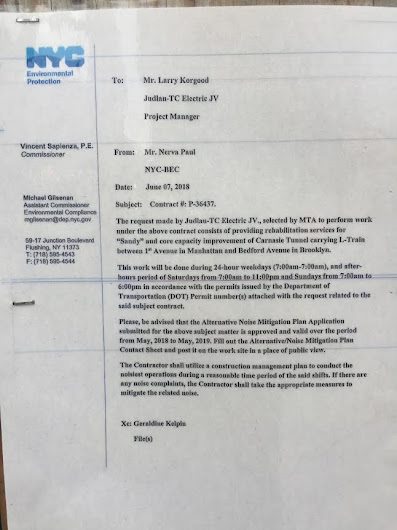 While all this has been going on, a crucial, game-changing piece of paper was tacked up at the site on the corner of 14th and A: A permit issued by DEP to the MTA approving 24/7 work hours beginning May 2018 for a full year. Mr. Nirva Paul at the DEP signed off on this permit (below) without the DEP having responded to a single one of our scores of complaints, and with no community interaction whatsoever. In our first meeting — not a publicly announced, town-hall meeting, but one organized for residents of 542 E. 14th St. with the MTA and Judlau Contracting, Inc. by Assemblymember Harvey Epstein — MTA and Judlau finally admitted ... that their diesel emissions are not being monitored, and their noise levels are not being monitored. We were told in that first meeting that they weren't monitoring diesel emissions because a) they weren't required to, and b) there is so much diesel in the air already, there's no point in monitoring it. The refrain from the MTA for the Carnarsie Tunnel Project has always been a firm, frantic — "This has to be done!" As if we're in an emergency state of repair. This is a bullying technique of they use to cover their bad planning. The fact is, Hurricane Sandy happened in 2012 and they've had six years to figure out the best way to do this work with minimal community impact. They are a state agency, and appear to be clueless about our how our neighborhood functions. This work has already greatly affected the businesses on 14th Street between B and First Avenue. Several have already gone out of business due to severely limited access to their storefronts. Several (west of Avenue A) are suffering because their customer access now is only 28" of sidewalk space, not big enough for a wheelchair in spots. What we learned in that first meeting was the MTA's plan to make that very spot, at 14th and A, the sole entry and exit point for all old tunnel materials and all new tunnel materials. Heretofore, they had told the public that the work on that corner was for the new stairways and elevator for the station. 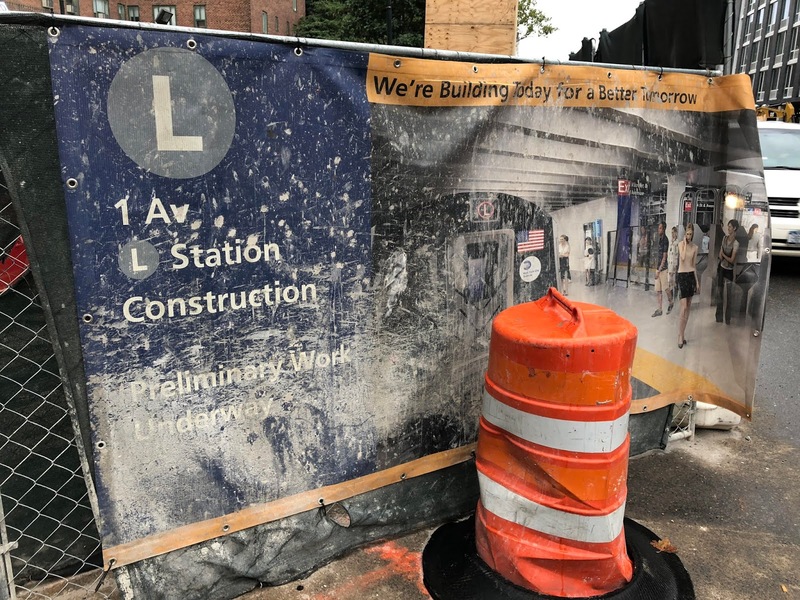 The work that's being done — long ahead of the stairways and elevator — is to create entry and exit points for a constant (24/7) flow of yet more diesel trucks removing debris that contains asbestos and silica dust (you can learn about that on the MTA's very own YouTube channel). Residents said that they have filed complaints with the MTA and the DEP. What has been their response? 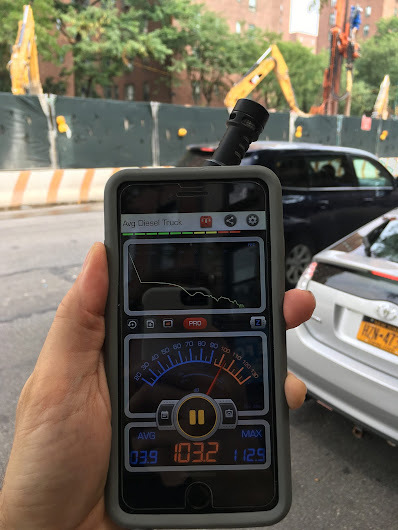 We — at least five of us in our building alone — have made a steady flow of very specific, documented complaints about violations to the MTA and the DEP about noise, diesel pollution and traffic congestion. We've had zero response from either agency. The only responses we’ve been able to obtain have been verbally, during the two meetings we’ve had so far with them and the Assemblymember. You said that MTA reps confirmed on Sept. 6 that the area between Avenue A and First Avenue will be the main staging area — 24/7 — during the reconstruction. Before this, were you aware of any public meetings to let community members know about the work? There were public meetings, but none of them addressed what you mention, which is what leaked, we believe for the first time, during our first meeting with the MTA, Judlau and Assemblymember Epstein. You can check the records on that — no publicly released information mentioned the staging area or the 24/7 work. The only work mentioned was installation of the underground power station at Avenue B, and the construction of the elevator and stairways down to the new station on either side of Avenue A. We know of no place this “main staging area” information was made public before now; if it was, it certainly is not known at all in the affected area. What is your biggest concern about the work? The fact that the MTA’s current plan is to truck out hundreds of tons of tunnel debris. Much of this debris is known to be contaminated with silica dust and asbestos as acknowledged by the MTA on its YouTube site. The Avenue A access point 50 feet from a school and church. 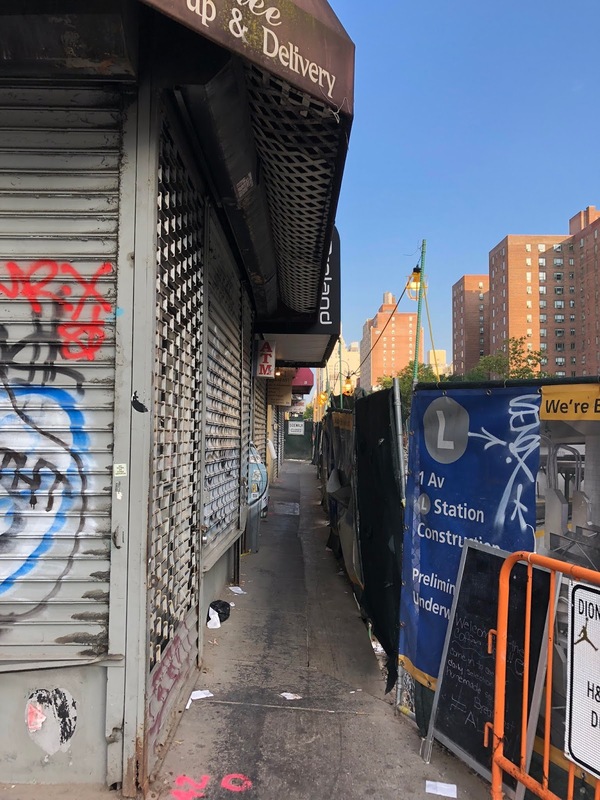 This debris will be carted out 24/7 for a year and a half, under tight deadlines and facing and with contractors facing stiff penalities for each day the deadline passes, through the streets of the East Village and Stuy Town. On the delivery end, the MTA will be commandeering the service/access roads of Stuytown to deliver all the tunnel materials, again 24/7. With a very conservative estimate of 30 trucks a day, that is over 13,000 truck deliveries, with all the pollution, idling, beeping and noise coming into what will be some of the most heavily-trafficked blocks and street in the city. The fact that we’re facing two years of diesel trucks lined up and idling, coming and going round the clock, in an already heavily congested area. The fact that the neighborhood will very likely to become a parking area for idling diesel trucks, 24/7. This alone will create conditions even more untenable than those we’re already facing. Why is this being done undercover, in such a shady fashion? The only answer to that is they know community response will be outrage once people have a chance to fully grasp what’s in store. Keeping it secret will allow them to get far enough into the project that there will, arguably, be no turning back. But the nightmare of the plan (and the congestion, not to mention the pollution), combined with their plan to use 14th Street for a substantially increased number of buses round the clock, will have a devastating effect on the area. Now that we know the plan, we’re calling on all public officials for our district to come out against the plan, and for the Mayor and the Governor to put a moratorium on work until an independent auditor can be brought in to assess the impact of this plan on the community’s health and well-being, and to engage the community in this plan. Debris removal from this entry point on 14th Street is likely among the topics to be discussed this evening during a Town Hall on the L tunnel reconstruction project. 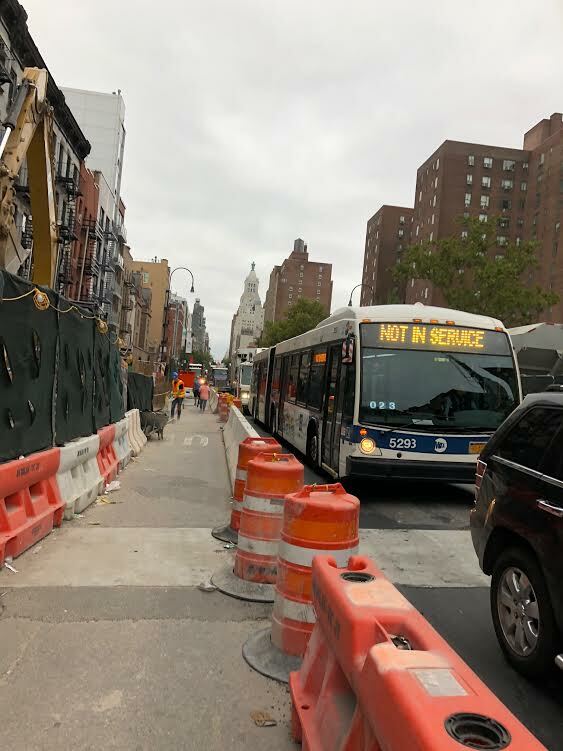 The event takes place at Middle Collegiate Church, 112 Second Ave. between Sixth Street and Seventh Street from 6:30-8:30 p.m.
You can find more info on the L-train reconstruction via this MTA microsite. Very well written article. Nailed it ........ secrecy until it’s to late to turn back. I live on 14th between Ave B and C. I've called 311 on more than 5 occasions this year due to construction beginning prior to 7AM. 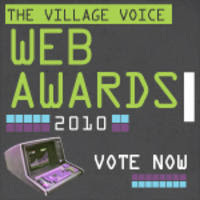 There were other times I should have and could have called to complain. 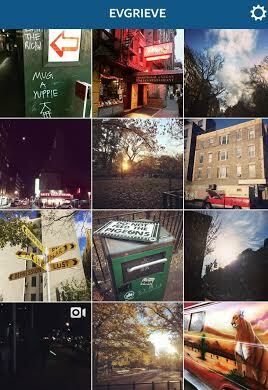 Great post on an existential disaster and the MTA's and their contractors devious tactics. This is not going to get done on schedule. 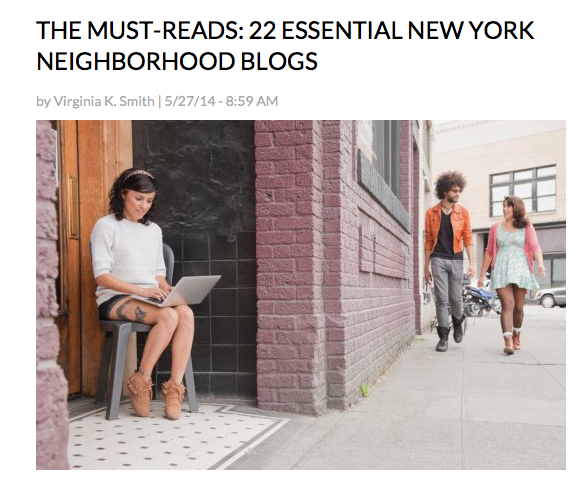 How will the beautiful people living in the East Village's Greatest Building are going to handle this? I get the complaint. Honestly I do. And it speaks to the shadiness of the MTA and how they neglect to inform communities on the true nature of their work. Calling for a stop on construction to allow for an independent auditor to monitor the situation is just not going to happen. For one thing, bring in an auditor can take months just to procure, and then months to study, and then months to approve new changes. That's already on top of a 3+ year project. And people wonder why these projects take so long, and become so expensive. And, no offense to the residents complaining, but think about how this project is needed for the 400,000 daily riders who use this line to get to and from. What has already been a boondoggle will be an incredibly insurmountable project because of complaints by these residents. And their complaint about having 6 years to fix this and not doing so...that's BS. They spent the better part of the 6 years fixing the Court St tunnels on the R/N lines. Both were necessary, but that had to be done first because it had the greatest damage. Unlimited asbestos and diesel emissions? 24/7 noise loud enough to cause permanent deafness? 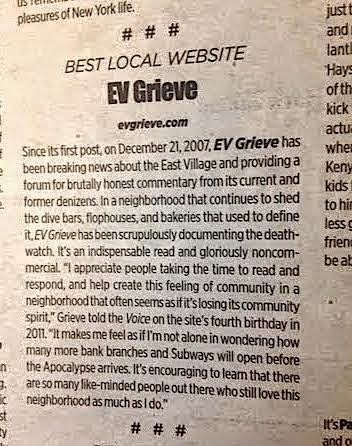 This sounds like the soylent green of subway projects. 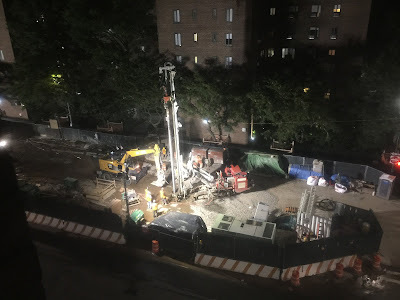 So are they going to have to destroy part of the neighborhood every time we have a Hurricane Sandy-level flood, or are they waterproofing all of the concrete, signals and electrical systems so that we don't have to do this again? William Wynne, did we read the same article? It doesn't say anywhere that anyone is in favor of not repairing the L-train. It doesn't say anywhere that six years is too long. The article is about the way the project is being handled and mismanaged and the deceptive flow of information to the public about what's in store. Own a small business and struggle along for years only to have an eight-foot fence put up 28" from your front door without forewarning, without compensation, and without any information as to way. Watch children on their way to school walk through puddles of spill-over diesel fuel. Study up on the reason DEP regulations are created in the first place, realize they're being recklessly and reprehensibly ignored, and know that any complaints made by tax-paying residents are systematically disregarded. It was the MTA's decision to route all the new buses (to compensate for the train shutdown) onto 14th Street. Approximately 550 out of the 575 brand new buses are diesel, by the way. It was the MTA who told us that 14th Street is the street that's going to be most affected by the shutdown, due to the increased number of buses running round the clock. And it's the MTA that has, now, made the covert plan to run construction trucks 24/7 on that very same street. With no Environmental Impact Study why? Because they aren't required to conduct one. With no diesel admissions test why? Because they aren't required to conduct one. With no consequence to their hundreds of documented violation complains why? Because they actually aren't required to consider the health and well-being of individuals who don't work for Judlau or the MTA. Of course this work has to be done, and of course it can take years to complete. We all understand that. But you could stand to become much more familiar with the project and its history and the way the DEP is asleep at the wheel before you call "BS." The MTA is public property - but we, the public property owners, are denied our rights to manage our common, mutual public property. The MTA board must be directly elected by all of us, the public property owners. I had marked my calendar, but I missed the town hall. Did anyone go? Can anyone recap? That'll solve, of course, only a small part of the noise-congestion problem. The residents of NYC seem to be the LEAST important consideration to NYC government and to the dysfunctional MTA. And if you own a business in that area, hey, NYC doesn't care about you either b/c you're not funneling enough $$$ into the right people's hands. This project is going to be a clusterf*ck of massive proportions; heaven only knows how many years it will ACTUALLY take. PS to Scuba Diva: I didn't go to the meeting b/c I can't stand the idea of being in the same room with traitor Carlina Rivera. 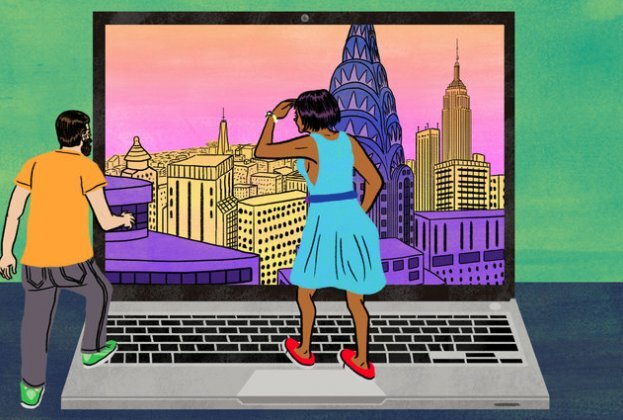 This project is NYC in a nutshell: government FOR the rich & powerful, BY the rich & powerful, with liberty & justice for ONLY the rich & powerful. Avoiding a problem won't solve it; I think we should BRING HER DOWN. 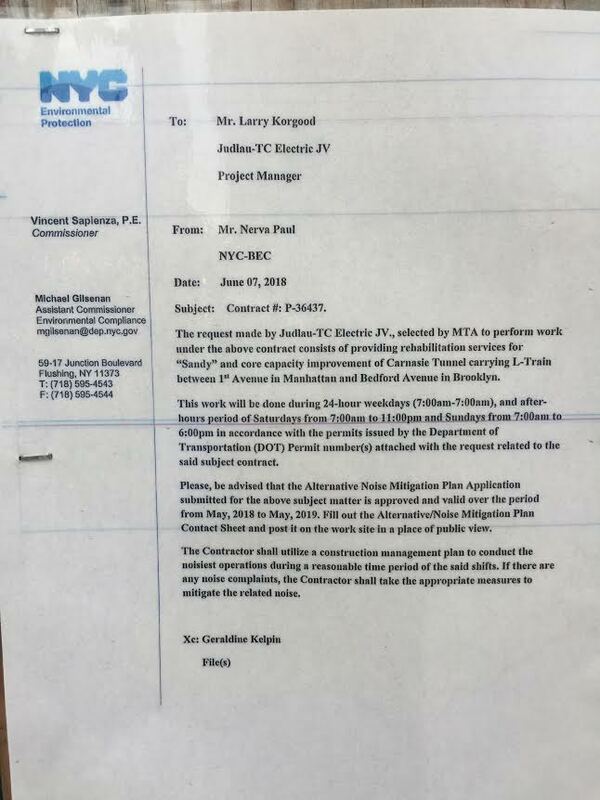 No Mr Borenstein, the MTA is NOT public property. Like the Federal Reserve, it is a PRIVATELY OWNED COMPANY. Which is why it consistently acts outside the law and heedless of the public with no oversight. FED and MTA are NOT govt entities. Wise up. But the biggest zap is yet to occur. All those citibike racks didnt come out of nowhere. Neither is the shut down. These are pilot projects to acclimatize everyone to eventual banning of cars and vehicles on this street, like the big clogged mess Bloomberg modeled in midtown around Herald Sq where "green spaces" with no auto traffic are allowed. The dunce who suggested rerouting it all to other streets is playing right into this secret scheme. In an area of aging populace, banning taxis and buses is outrageous. They already did away with our hospitals. Guess its part of their depopulation plan?